Captain Wright and his staff guides have been fishing the Park since 1972. 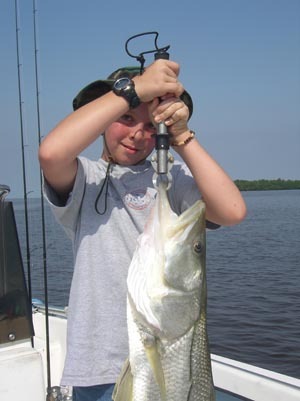 Permit, Snook, Tarpon, Redfish, Grouper and Cobia fishing are Chokoloskee Charters' specialty. Whether you fishing Chokoloskee fly-fishing, using spinning gear, plug casting or fishing live baits, we have the state-of-the-art equipment, local knowledge and expertise to deliver a wonderful trip regardless of your experience level. Everglades Kayak Fishing, using dedicated kayak transport mother ship to bring your outfitted fishing kayaks and gear to the deep everglades tarpon fishing is out newest trip. Kayaks are revolutionizing shallow water and backcountry fishing. Florida kayak fishing is superb in the massive area of protected water. 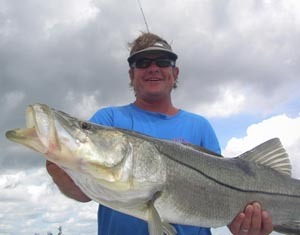 Everglades snook fishing deep into the backcountry with experienced Florida kayak fishing guides is a trip that you will always remember. If you are planning a business outing, then Chokoloskee Charters is for you. With our network of guides, boats, hotels and restaurants, we coordinate complete corporate packages for fisherman of all experience levels. Please call us to make your next corporate outing one to remember. While Everglades City and Chokoloskee Islands restaurants, attractions and accommodations. Experience the Everglades on eco-tour Everglades Area Tours. Enjoy the a smoothie or cup of coffee the Big House Coffee. For lunch try, Triad Seafood, City Seafood Market or the Havana Cafe'. The Seafood Depot opens early for breakfast and stays open late for dinner. Take an airboat ride through the saw grass prairies with Speedy Johnson's Airboat Adventures, or rent a fishing kayak from Everglades Kayak Fishing. Visit the Museum of the Everglades in Everglades City or the Smallwood's Store in Chokoloskee. Pamper yourself at the Everglades Spa-fari Day Spa. Excellent accommodations are provided by the Ivey House Inn, the Bank of the Everglades B&B and the Rod and Gun Club. Perhaps our own "Kayak Shack" cabin is your style. Should you fall in love with the area as we have, drop by Glades Realty to find your place in paradise.